"This water flows east, descends to the Arabah and then into the sea, the sea of stagnant waters. When it empties into those waters, the sea will become fresh. because the river is turning the salt sea into fresh water. Where the river flows, life abounds. The sea will teem with fish of all kinds, like the fish of the Great Mediterranean. "The swamps and marshes won't become fresh. They'll stay salty. 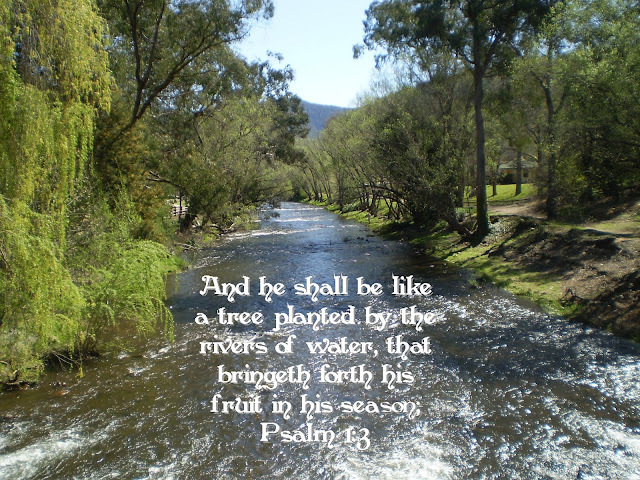 "But the river itself, on both banks, will grow fruit trees of all kinds. Their leaves won't wither, the fruit won't fail. Every month they'll bear fresh fruit because the river from the Sanctuary flows to them. I love taking this verse and applying it to my soul. my heart. my life. How I was "the sea of stagnant waters" before His Waters flowed into me. How He has transformed my whole being into "fresh water" - flowing and life abounds. Where I am not alone, where I stand "shoulder to shoulder" with His family - my family. Casting our nets - living as "fishers of men". How even though there are still "salty places, which aren't fresh" in my life, His waters are more vast. His waters are where I come to refresh, to be made strong. His Waters have cleansed me and I know I will never again be stuck in the mires of the swamps and marshes. How I love that I am a strong "tree" in Him, a tree which bears fruit for Him. How I love that He is The Tree. In which my roots have come from. In which the leaves never wither, which provides the constant fruit. How I love He feeds me, provides for me. How I love the cool, healing balm of Him. How I so love His Words. His personal love letter to me.